The Campbell River Storm team members with Dustin. Photo courtesy of Ashlea Christie-Peachey. CAMPBELL RIVER, B.C. – Dustin Wright-Morris was in his last night at the hospital when he got a pleasant surprise. 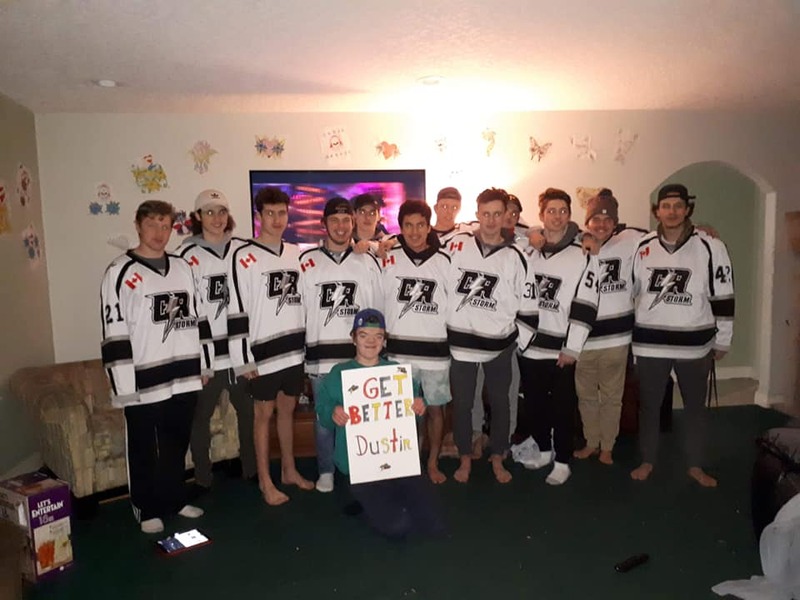 The Campbell River Storm came to visit him on Thursday night and gave him a handmade card, signed by the team members themselves. 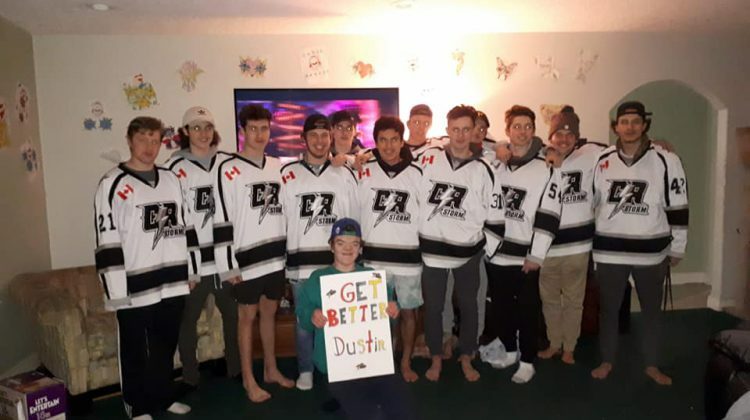 Ashlea Christie-Peachey reached out to both the Campbell River Storm and the Vancouver Canucks, asking if the teams had time to visit her friend’s son. Dustin has Apert Syndrome, and has gone through 17 major surgeries and numerous minor ones at only 17 years old. Dustin is a big hockey fan with a “mean slapshot” according to his mom, Toni Morris. Morris said she missed the visit because of work, but she saw the pictures and videos, and she said she’s so grateful for the time the team took to visit her son. “I cried at work… because he cried,” she said. Christie-Peachey said she’s also grateful the Storm took time between games to visit Dustin. “Coming here, seeing the hometown team here do that for somebody was just amazing. You see how big their hearts are,” she said. She said Dustin will also get an opportunity to join the team in the dressing room before a game, but they have yet to schedule that. Christie-Peachey said she wanted to give back to Dustin’s family for all they’ve done for her since she moved to Campbell River from Sarnia.